Through the summer, we have profiled the players, coaches, management and owner as each enjoyed a personal celebration with the Stanley Cup. But it is important for readers of Stanley Cup Journal to understand that the iconic trophy is accompanied at all times by an employee of the Hockey Hall of Fame. On the surface, being 'Keeper of the Cup' is the greatest job in the world, but beneath the shiny veneer, it is truly one of the great unheralded jobs, with itineraries that leave little time for sleep and include extended travel that takes the Cup Keeper away from family and friends over long periods of time. Yet, there's not a hockey fan we've ever met who wouldn't trade his or her soul for the chance to accompany the greatest trophy in sport - the Stanley Cup. 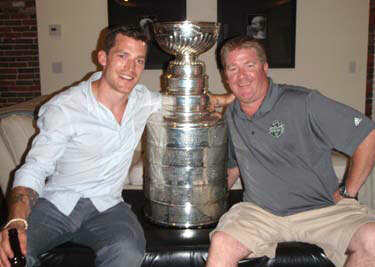 Mike Bolt spends almost as much time with the Stanley Cup as the NHL's championship team. Crisscrossing the continent, Mike ensures that the rights and privileges that accompany winners of the Stanley Cup are both enjoyed and upheld, doing so in a firm yet entertaining manner. Loved by both players and management, Bolt is a hockey fan first and foremost, but treats his job with the seriousness it demands. Even NHL Commissioner Gary Bettman once took him aside and said, "You've got an awesome job." Born and raised in Toronto's Leaside area, Mike Bolt was no different than most other hockey-playing boys -- he, too, dreamed of one day hoisting the Stanley Cup over his head. But his career path took a different turn early on, and instead of a hockey career, Mike managed a cowboy boot and western wear store in Toronto. It wasn't until 1995, when he joined the Hockey Hall of Fame as a guest services associate, that the path veered back towards hockey. Mike's first foray with the Stanley Cup was a quick jaunt down the street from the Hockey Hall of Fame to the studios of the CBC, Canada's public broadcaster, in 1997. 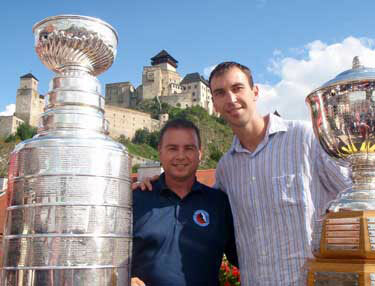 The summer of 2011 was highly enjoyable for Bolt, who spent his fourteenth year accompanying the Stanley Cup. Mike reflects on a wonderful summer. "Any time I'm with one of the winners is special. It is such an honour to be around any of these champions as they spend their day with the Cup. But while being a Cup Keeper is tiring at times, it is worth every second when I see the joy the Stanley Cup brings to the family and the community of the champions. Every day is a special day when you're with the guys who have won the Stanley Cup. It's been every kid's dream, and the players are living that dream. Watching them with the Stanley Cup is amazing. That part of the job never gets old!" Howard Borrow is the newest of the Keepers of the Cup. A Toronto native, Borrow spent time in Parry Sound and in Durham before locating back to his hometown. Howie was a late-comer to hockey. "I didn't start my hockey life until I was in my 20s," he explains. But coaching his boys in hockey fuelled a passion for the game that led him to working as an off-ice official with the Mississauga Ice Dogs, the Toronto Marlies and on to the Toronto Maple Leafs. He earned a degree in sport management at Brock University in St. Catharines and added volunteering at the 2000 NHL All-Star Game, the NHL Awards and the NHL Draft to his resume. The newest Cup Keeper joined the Hockey Hall of Fame as a volunteer seven years ago, and was soon working there part-time, building his network by working on events. When offered the opportunity to take the Hart, Norris and Vezina trophies to Michigan for the Ted Lindsay Foundation, he jumped at it. That led to his first opportunity to accompany the Stanley Cup — at Mississauga's Hershey Centre for an NHL Alumni Game. Often travelling with heavy eyelids after little sleep, he comments on the daily rituals. 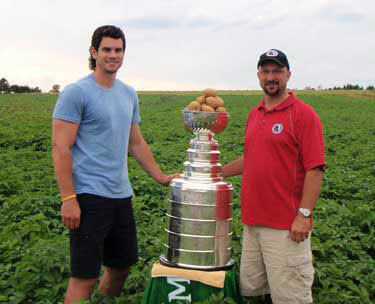 "Most guys get the Stanley Cup first thing in the morning and have it until late at night. Eighteen hour days are part of the routine, but I wouldn't change it for anything!" Like Mike Bolt, Howie also appreciates the honour of accompanying hockey's highest prize with the champions through the summer. "The entire summer was a highlight for me." Would Walt Neubrand trade the opportunity of being Keeper of the Cup for any other job in the world? "No way," he replied. Walt Neubrand was born in Mississauga, just west of Toronto, and learned his hockey on the frozen surface of the Credit River. Although always a hockey fan first and foremost, Walt was also a baseball player up through his teenaged years. After graduating from the University of Waterloo, Walt joined the Hockey Hall of Fame in 1995, working as a guest services associate. Two years later, he got his first taste of working with the Stanley Cup. During the Detroit Red Wings' Stanley Cup championship in 1997, Walt was asked to accompany the Cup to Scotty Bowman's home in New York State. Neubrand briefly left the Hall of Fame in 2000 to become a police officer, but after graduating from the academy, realized that that life was not for him, and returned to hockey. 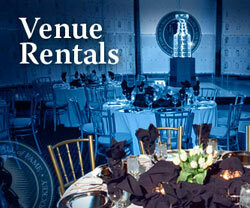 But the training comes in handy should any incidents occur that involve the Stanley Cup. "I've never had any real problem," Walt admitted. "Everyone who comes to see the Cup has been nothing but respectful." Being one of the Keepers of the Cup has certain advantages. While accompanying the Stanley Cup to the NHL All-Star Game in Tampa in 1999, Walt met a volunteer from Detroit who would later become his wife. The two introduced themselves, and in 2003, Walt and Laura were married, settling into life in Hamilton, Ontario, where they are now parents of two young girls. Spending so many days on the road with the Stanley Cup, Walt has seen the trophy in hundreds of different situations. "My favourite trip was taking the Stanley Cup to Rankin Inlet in Nunavut for a hockey tournament," explains Neubrand. "I love the wilderness, and this was an area above the tree line where there were no roads. People in the area are so passionate about hockey that some drove 250 miles by snowmobile just to see the Cup!" Now that the Stanley Cup's travels have wound down for another summer, Walt has returned to being an elementary school teacher, although he will occasionally travel with Lord Stanley's Cup through the school year when time allows. "Being the Cup Guy is a great job to have," Walt confirms. "As long as they allow me to do it, I'm honoured to accompany the greatest trophy in sports, the Stanley Cup." The glove-wearing Keeper of the Cup has become an iconic symbol within the sporting world, so much so that the Hockey Hall of Fame uses the imaging as the basis of marketing campaigns, including contesting and television commercials. 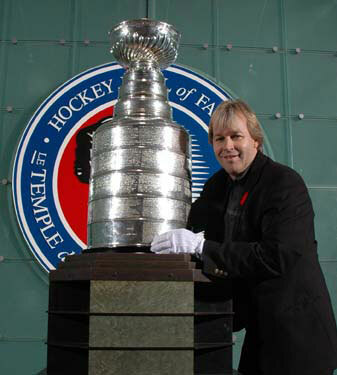 The popular commercial featured the Stanley Cup and its well-recognized Keeper, Phil Pritchard. In 30 seconds, the commercial followed a day in the life of the Vice President and Curator of the Hockey Hall of Fame. Born in Oakville, Ontario, Phil's hockey career began later than that of most Canadian boys. His British-born parents weren't raised with Canadian customs like hockey, so after playing road hockey with his pals for a number of years, Phil was finally able to convince his Mom and Dad to register him for ice hockey, and at 13 years of age (six or seven years later than most of his peers), he began playing Bantam. Pritchard had discovered his passion, and now not only works in the hockey industry, but plays ice hockey and ball hockey several times a week all year round. Phil distinctly remembers the genesis of his love for hockey. "In 1969, there was a Boston/Montreal game on the radio. I was listening to it and loving it. My Dad taped the game, too. I still have that tape at home," he recalls. Phil's first brush with the Hockey Hall of Fame occurred shortly afterwards. "In 1971, I dragged my Dad to the (Canadian National) Exhibition so I could go to the Hall of Fame. Phil Roberto was signing autographs that day and the Montreal Canadiens had just won the Stanley Cup. I stood in line with all the other kids and met Phil Roberto. I've kept his autograph too, and ran into him not long ago. I told him the story and he laughed. He remembered the day; it was the only day he ever signed at the Hockey Hall of Fame!" On September 24, 1988, Ben Johnson won the gold medal in the 100m sprint at the Seoul Olympics. "No one can take it away from me," said the sprinter with more than just a bit of irony at the time. The following Monday, the Olympic committee did just that, stripping Johnson of his gold medal. "I'll never forget that day," mentions Pritchard. "That was the day I started at the Hockey Hall of Fame." Phil was one of eight employees, and as the Marketing Administrative Co-ordinator, found himself working at reception, in the gift shop and doing anything he could to promote the Hockey Hall of Fame. "In October 1988, Jeff Denomme (now the Hockey Hall of Fame's president and COO) and I took the Stanley Cup to the Newmarket Minor Hockey Association's annual banquet. People were thrilled. That was the first time I ever held the Stanley Cup." In the twenty-three years since, Pritchard has been around the world several times, traveling more than a hundred days each year with hockey's most cherished prize. "History is being made every time the Cup goes out, and I am honoured to be part of that history," admits the modest Pritchard. Often, Phil is almost as well known as the subject he's traveling with. "Mom, look! It's the guy with the Cup from the commercial," kids announce, and Pritchard graciously, if not shyly, has his picture taken with the children or shakes their hands. Many want to know where his white gloves are, and Phil readily pulls a pair out from his pocket. "I go through a lot of gloves each year," he laughs. It is near impossible for Phil to isolate a single trip with the Stanley Cup that was more meaningful than the others, but he does show a genuine enthusiasm for the Stanley Cup's first trip to Russia. "After the Red Wings won the Cup in 1997, plans were made for Igor Larionov, Slava Kozlov and Viacheslav Fetisov to take the Stanley Cup to Russia for the first time. When we got there, the players took the Cup off the plane. It was a rainy, dreary day, but there were thousands of people there to see the Stanley Cup. Fetisov walked the Cup over to the chain link fence, and people stuck their fingers through it to touch the Cup. It was absolutely amazing! These people knew their hockey inside out and really appreciated the legacy of the Stanley Cup. We were in Russia for five days, and visited Lenin's Tomb, Red Square and a lot of historic places." Moscow mayor Yuri Luzhkov admitted, "I am not a hockey expert but I am sure that the Stanley Cup is one of the most prestigious awards in the world of sport." Pritchard has never lost his boyhood excitement for either hockey or for the Stanley Cup. "No matter whether it's little kids or adults playing a kids' game, the reaction is the same," states the Hall's VP. "In today's world, it is wonderful to be able to do something that makes people smile. Whether it is a visit to a player's hometown or taking the Stanley Cup to visit kids in the hospital, it is the greatest feeling in the world to know that what you do makes someone smile. Everyone has a special place in their heart for the Stanley Cup!" The Stanley Cup Journal is now concluded for 2011. 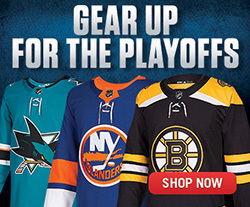 The reigning Stanley Cup champion Boston Bruins now must defend their hard-earned right. Will they repeat? We have 82 wonderful regular season games and the 2011-12 post-season to find out!